There are a million diets out there and lots of confusing and sometimes conflicting advice about what foods are healthiest for our bodies. Should we be eating healthy fats from nuts and fish? Should we be going vegan? Are trans fats the enemy or is it sugar? Or gluten? Should we cut out animal proteins, dairy, sugar, fat, grains, and all carbohydrates including fruit? Should we become breatharians and live on a single inhale a day? Nah. That’s too much work. Besides, it may not matter all that much. All the best science we have on food and digestion says that we should eat a variety of whole foods and not too much processed sugar. Every microbiome is unique, so we all digest food in different ways. It may not matter so much what’s in our diet aside from finding what works best for us. What may matter a heck of a lot more is howwe’re eating the food we’re choosing. North Americans notoriously struggle with food issues. Many of us are dangerously overweight and plenty of us struggle with eating disorders including anorexia, bulimia, or binge eating disorders. A recent survey found that 74 percent of Americans are dealing with digestive discomfort on a regular basis, and most of those aren’t talking to their doctors about it. Plenty of us don’t identify with any specific disorder but still eat emotionally, snacking when we’re not hungry. We obsess about which foods are “good” and which are “evil” but we don’t stop to think about how to improve our relationship with the food we’re eating. What a lot of us are missing is a healthy rhythm. Digestion takes a lot of energy. So does stress. These two end up in a battle for resources. When you are anxious and you feel butterflies in your stomach, that’s likely blood and energy leaving your guts to head to your extremities so you can fight or run away. Sometimes the body signals to the digestive system to eject whatever is in there so it can commit all its resources to the battle at hand. That’s why we sometimes get nausea, diarrhea, or even vomiting before doing something scary like giving a speech or going on a first date. In order to properly digest our food, the body needs to be at rest. It needs to deal with the massive project of turning something from the outside world into a properly functioning body. Many of us do not give our bodies this rest. We eat while we’re working, when we’re anxious, when we’re on the go. Eating can help calm us down—there probably aren’t any saber-tooth tigers chasing us if we’ve got a bag of Cheetos on the go. But food is not metabolized that well when we are stressed. Brain fog, exhaustion, and unbalanced mood might simply be an issue of the brain and the stomach battling for limited resources. 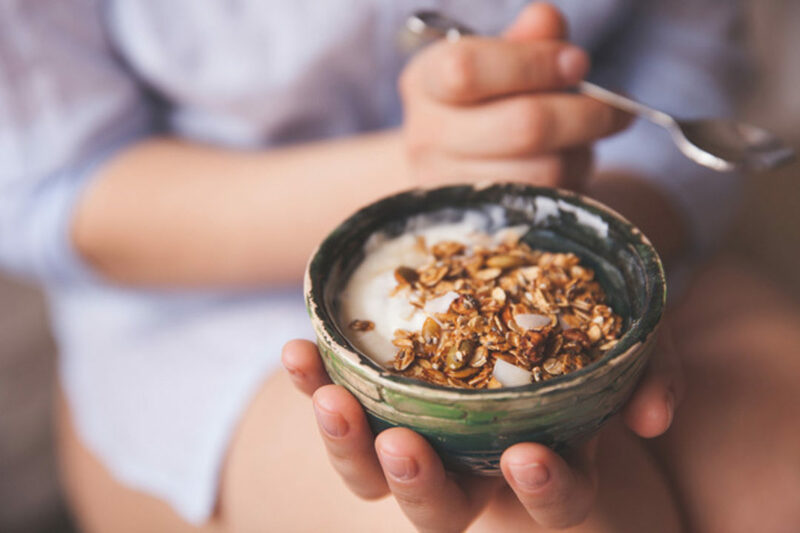 Constant snacking also interrupts the migrating motor complex (the MMC), a muscular sweeping mechanism where the digestive system clears out particles of undigested food, ensuring the bacteria in the gut is balanced. When the MMC is inhibited, we can get bacterial imbalances and other problems, impacting our ability to digest our food well. The MMC only functions when no new food has entered the system in at least 90 minutes and will stop the moment it encounters a new calorie. In order to best support the MMC, we should leave at least 3-4 hours between meals and around 10 hours overnight with no food or beverages (except water, which is helpful).